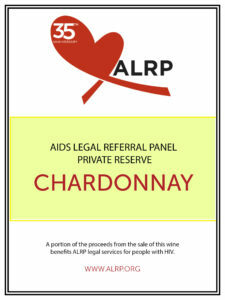 Support ALRP through the ALRP Private Reserve Wine Program. These amazing Chardonnay and Cabernet Sauvignon wines are sold by the Case. 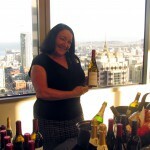 Or order a 1-Bottle or 2-Bottle Wine & Chocolate Gift, or a VIP Gourmet Executive Gift. Or get Two ALRP Wine Glasses in a Boxed Set. It’s the gift that gives back to the community – 35% or $35 of every purchase is donated to support ALRP programs! – Chalkboard Heart with YOUR CUSTOM gift message! Two 21 oz. stemless Wine Glasses with ALRP logo – each individually packaged in white box with red ribbon. 35% of each case purchase is donated to ALRP!! SHIPPING & TAX not included. $35 of each case purchase is donated to ALRP!! ALRP’s wine partner is JK Cellars of Amador County in the Sierra Foothills. 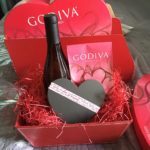 TO ORDER for FOR MORE INFORMATION: Please CALL OR TEXT KIMBERLY at (415) 994-1097 (or email Kimberly@hathawaypr.com) for all wine, glass and basket orders to allow for personal customization and to arrange Bay Area or out-of state shipping logistics. Shipping & Tax not included. THANK YOU for supporting ALRP! *Brand selection subject to availability, but will always be Ghirardelli or Godiva. ** Custom basket orders gladly accommodated – minimum of 5 business days lead time. NOTE: Wine purchases are not tax deductible; the fair market value of your purchase equals the purchase price/retail value, and therefore is not tax deductible for charitable purposes. 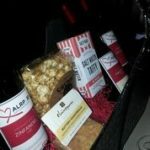 Your wine purchase will generate a donation to ALRP’s Heart of the Family 35th Anniversary Campaign. 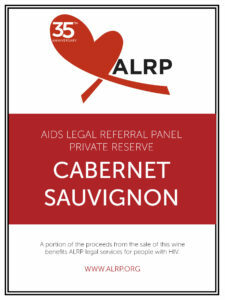 Thank you for supporting ALRP’s free legal services for people with HIV/AIDS!